I published my first book back in 1997. Since then I have written and / or illustrated more than a dozen others. I think the reason why I’ve dedicated my life to get kids to read is because I went through most of my life not enjoying reading whatsoever. In fact, whoever coined the term “reluctant reader” must have known me as a kid. And as a teen. And even as a young adult. To be honest, I was a grown man before I ever read a book on my own for enjoyment. It’s not that I couldn’t read, I was an “A” student who made Honor Roll every semester. It was that reading was never anything that was fun. Actually, it was a chore, like mowing the lawn. (Even though there were no lawns in the Washington Heights section of NYC, where I grew up.) And for a kid with a very active imagination, I needed something to grab my attention. I know my parents read to me as a kid, but once the Dr. Seuss stage passed, I was on my own.Sure, I’d see them read newspapers and magazines, but have few memories of them with books. Fast forward to college where I attended The School of Visual Arts. Most people who know that I went there, think that I was a cartooning major. But the cartooning classes were so popular that I was never able to actually sign up for one. Instead I majored in advertising copywriting where I wrote headlines for newspaper ads, radio commercials and TV commercials. This was right up my alley. What I wrote could be funny, it could be serious, but whatever it was, it had to be short. Fast forward about 10 years, when I left the struggling advertising world to get a job at King Features Syndicate and later at Sports Illustrated for Kids. It was during this time that I had created my Mama’s Boyz comic strip. Again, the writing was funny and short! This was way back when personal computers just started taking off. And for the first time in my life, I found something that I actually ENJOYED reading other than comic books. Software manuals! Really! I could actually sit down for hours and read a book on how to use Photoshop or Flash. The books were not only huge, nor were they the least bit exciting. But for some reason, I LOVED them!!! 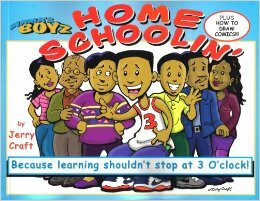 Then one day I got an email from a fan of my Mama’s Boyz comic strip. I used to have a page on my website where I showed how slang had changed from my father’s era, to mine, to the current group of teens. After exchanging a few emails, he told me that he was an author and wanted to know if I wanted to swap books with him. Why not? I sent him a copy of Mama’s Boyz: As American as Sweet Potato Pie! (which I had published myself), and a few days later I got a package in the mail with not only one book, but two! And they were long. “Aw crap, I remember thinking, now I HAVE to read both of these books, ‘cause he’s gonna want to know what I think of them.” And so I started the task. By now, I was married and living in Connecticut, so I had a few hours commuting on MetroNorth each day that I could devote to reading them. And you know what, I liked them. In fact, I LOVED them!!! 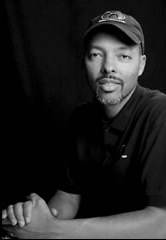 When I was done, I was proud to write my new author friend, Mr. Eric Jerome Dickey and tell him what I thought of Sister, Sister and Friends and Lovers. From that point on, I felt like a superhero who had gotten super powers as a result of some freak accident. I LIKED TO READ! Now it was a matter of catching up on books that I had always heard about, but had never actually read. Classics like The Autobiography of Malcolm X and Invisible Man. A few years later I had kids. Not wanting them to be reluctant readers like their dad, I literally read to them every single night for the first six years of their lives. Maybe longer. And then they’d read to me. Or we’d do it together. Short books. Long books. Everything we could get our hands on. I even did voices for the characters. Plus I made sure that they saw characters who looked like them. 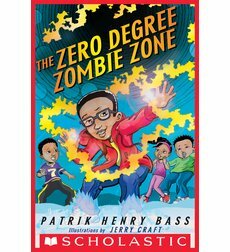 Their bookshelves were filled with names like Eric Velazquez, Bryan Collier, Shadra Strickland, Don Tate, E.B. Lewis, R. Gregory Christie, and anyone whose last name is Pinkney. Then when I decided to write chapter books, there was no better sounding board than the two of them. They were my own private focus group. A few years ago, I was reading them a story that I was working on about 5 middle school bullies who get superpowers. And this time, instead of just sitting back and listening, they (now teenagers) were critical. Very critical. “Dad, no kid would say that,” I remember one of them saying. “Well what would he say?” And they told me. And it was good. After a few sessions of them setting me straight, I decided to make them co-writers. Luckily they accepted. 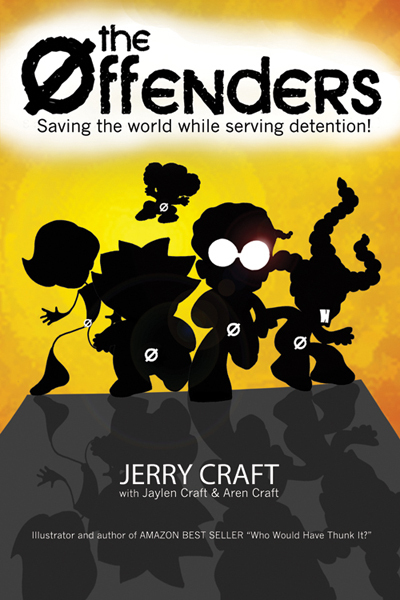 And after about a year of writing, we were overjoyed to see, “The Offenders: Saving the World While Serving Detention!” published. I had not only come full circle, from reluctant reader, to reader. Then to father of readers. Now that they had actually helped to write a book, they had broken through the circle. And that’s something that even a little boy from Washington Heights with an active imagination would have NEVER imagined possible. “Dad. No kid would say that.” Ah, the voice of the beta-reader. Snickering at the Faulkner; so glad you finally found something you LIKED reading, and thanks for sharing it with more kids!